26 Nov, 2016 | Articles on Cinema / Articles on Music, Poetry and Life / Did You Know! It’s not an unknown fact that Kundan Lal Saigal was the inspiration for many renowned singers of Hindi film music including Mohd. Rafi, Mukesh, Kishore Kumar and Lata Mangeshkar. And the exceptional singer-actor is widely considered as the first superstar of Hindi films too, though the term later came into existence with the arrival of Rajesh Khanna. Revealing his admiration for the blessed performer, Mohd. Rafi approached Naushad with the wish to sing with Saigal in the mid-40s and providing the dream opportunity to the then young singer, Naushad gave him two lines to sing in the song ‘Mere Sapno Ki Rani, Ruhi, Ruhi, Ruhi” apart from performing in the chorus for film SHAHJEHAN (1946). 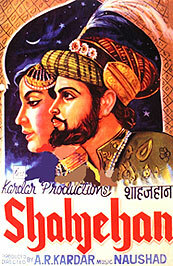 One of the last films of the star, it also had one of his most famous tracks, ‘Jab Dil Hi Toot Gaya’ becoming the swan song of Saigal who died in January 1947 at the age of just 42. Incidentally the hit song, which he reportedly wished to be played on his funeral too! So among all the true admirers of the singing legend, it was only Rafi who got the rare opportunity to sing just 2 lines in a song as ‘‘Mere Sapno Ki Rani, Ruhi, Ruhi, Ruhi” in the year 1946 that were penned by Majrooh Sultanpuri who interestingly also made a debut as a lyricist with film SHAHJEHAN. 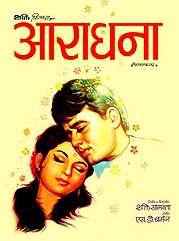 However the song still later found its connection with both Kishore Kumar and Anand Bakshi post two decades in ARADHANA released in 1969, when Bakshi wrote another hit with the same opening phrase ‘Mere Sapno Ki Rani’ and Kishore Kumar made it a rage in the melodious composition by S. D. Burman. Concluding it in a musical manner, where the first “Mere Sapno Ki Rani” was sung by K. L. Saigal along with Mohd. Rafi in the composition of Naushad and lyrics by Majrooh Sultanpuri in the year 1946, the second ‘Mere Sapno Ki Rani’ was sung by Saigal’s admirer Kishore Kumar under the music direction of S. D. Burman with the lyrics by Anand Bakshi in the year 1969. But sadly where the first is included among the swan songs of the superstar leaving at such an early age, the second announced the arrival of another making a grand musical entry winning hearts all over as Rajesh Khanna. Tags : The one exceptional phrase connecting K. L. Saigal Mohd. 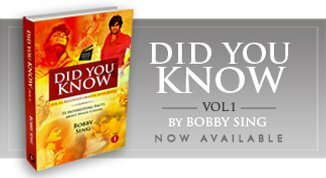 Rafi Kishore Kumar and Rajesh Khanna together, Did You Know facts by Bobby Sing at bobbytalkscinema.com, Rare unknown facts about Hindi Cinem at bobbytalkscinema.com, Articles on Music and Cinema by Bobby Sing at BTC.